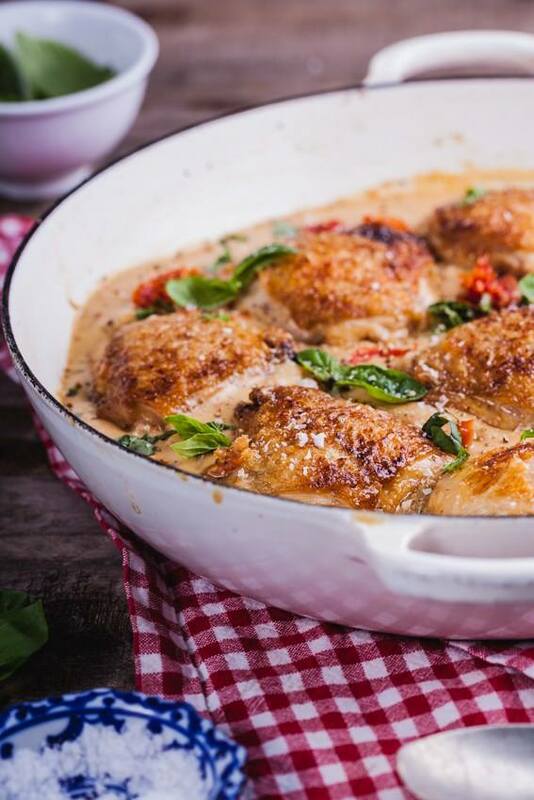 Chicken thighs cooked in a luscious, creamy sun-dried tomato and basil gluten-free sauce. Heat a large, deep pan over medium-high heat and add a splash of oil. Brown the chicken thighs on both sides until they turn a deep golden brown and are cooked ¾ way through. Add a bit more oil to the pan if necessary then sauté the onion until soft and glossy. Remove the stalks from the basil leaves and chop finely. Reserve the leaves for later. Add the basil stalks and garlic to the onions and sauté for 30 seconds before adding the sun-dried tomatoes. Sauté for another minute then pour in the chicken stock and cream. Allow to come to a simmer then place the chicken back in the pan and cover. Allow to simmer for 10-20 minutes, checking regularly to make sure the liquid hasn't cooked away (top up with more stock if necessary), until the chicken is cooked through. At this stage, the sauce will probably have reduced but if you want more sauce (to serve with rice, for example), add another cup of stock (and more cream if you wish) then add the corn flour and milk mixture. Allow to simmer for 10 minutes until thickened. Slice the basil leaves and add them to the chicken along with the lemon juice, salt and pepper before serving.